Wow. 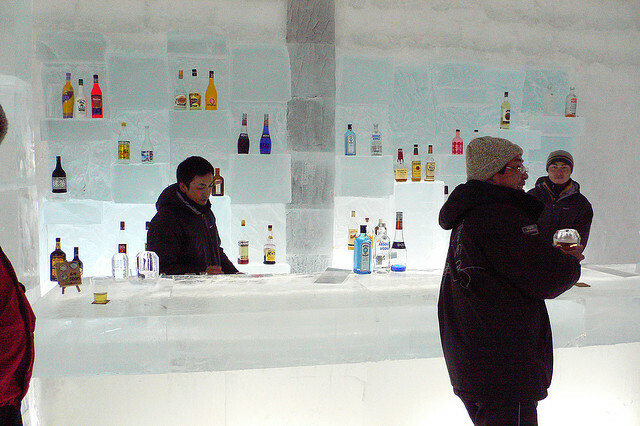 Look at this (o_O) The bar in this photo is made with ice blocks! It looks freezing but very beautiful, doesn’t it? You can enjoy many things in this icy village! * Outside bath on the icy lake surface >> Hot spring water is diverted from a nearby onsen. * Ice theater in an ice igloo >> The screen is ice as well! * Balloon ride over the icy field >> Enjoy marvelous scenery! * Musical Events >> Many kinds of concerts take place. Don’t forget to wear lots of warm clothes.